Silicon Valley software giant Intuit has been around 35 years ago—so why is it launching its first corporate brand campaign now? The company has long supported two of its biggest brands, QuickBooks and TurboTax, with national ad campaigns. Yet few know that Intuit is behind both of those products in addition to web-based financial management service Mint. Chief marketing officer Lucas Watson said corporate brand recognition is low despite the fact that Intuit’s services have a combined 46 million customers. “Even among people who use our products, only four out of every thousand use two or more,” he told Adweek—and that’s something Intuit wants to address given recent advancements to integrate its programs, which function better when used together. Around a year ago, Phenomenon came up with the idea of using a giant robot to represent the power of Intuit’s services and soon settled on animation as the best way to tell the brand’s story. “[Animation] allowed us to create a metaphorical world instead of confusing it with the real world and sweat the details of how characters are developed and to tell the emotional arc in an inspiring way,” said chief creative officer Chris Adams. 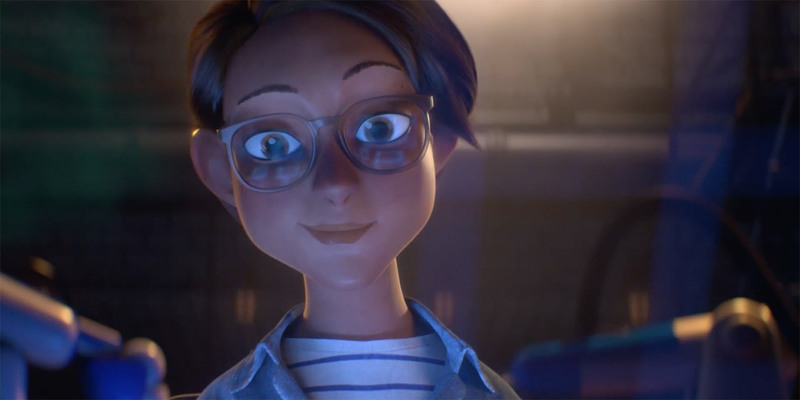 Phenomenon partnered with production company Passion Animation Studios, which may be best known for its Chipotle and Spanish Lottery campaigns, to create the short film debuting today on platforms including YouTube, Facebook and Instagram. A 15-second broadcast ad running during Super Bowl LII features characters from the long-form spot and drives viewers back to the full film. The social media component of the campaign also includes a custom Snapchat filter starring the Intuit Giant. “A Giant Story” uses the robot as a metaphor for the way Intuit’s services harness data and technology to make the complex simple for its customers, Watson said. It humanizes the brand’s story via the tale of a flower shop owner named Pete, who is too bogged down in the minutiae of running a business to enjoy his passion, and Pari, an engineer and entrepreneur who is inspired to help him by building the Intuit Giant. The fact that “A Giant Story” focuses on a self-employed small business owner is not incidental. The campaign specifically targets freelancers, small business owners and other self-employed individuals. While Phenomenon originally began working with the client as more of a digital and strategy partner, Adams explained that Watson gave the agency a month to come back with an idea for a brand campaign telling a complete corporate brand story.